Has anyone life cast their own face? I am having a problem finding anyone to life cast my face. So I am thinking about doing it to myself. Has anyone else tried this? What challenges did you encounter? I haven't tried it on myself, but I could see it being pretty difficult when it comes to applying plaster bandages (since moving could pop off the alginate... and it would take an incredible amount of pre-planning). I grabbed a couple of family members and walked them through it in a short break down to help me out and it turned out really well. I don't know if you're having a problem finding those who already know how to do it, or just anyone at all, but teaching someone the steps is easier than trying it on yourself. In my opinion at least. 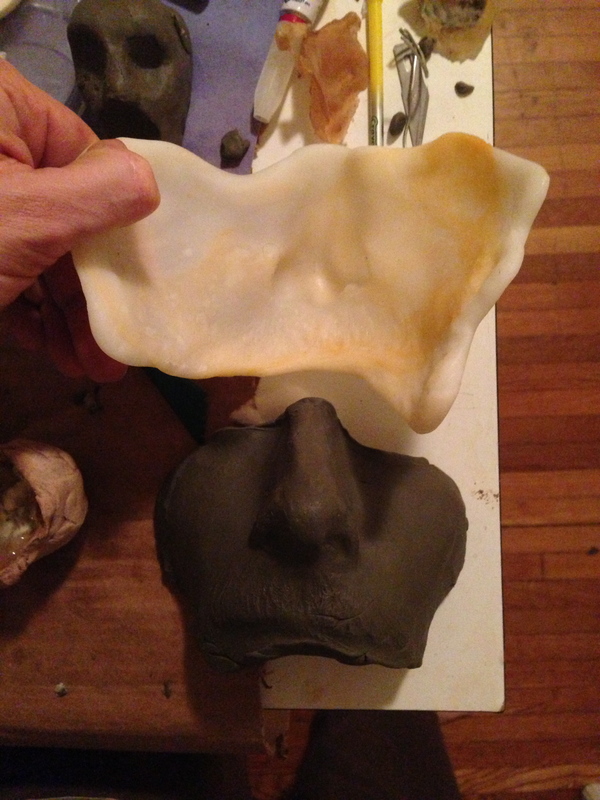 Lifecasting your own face is pretty dangerous, and the resulting molds would likely not turn out well. During the casting process you need to pay careful attention to material thickness, coverage, and keeping a safe distance form the nostrils. Doing all that while blind is asking for trouble. Creating a plaster shell would also be very difficult, and removing your face could be problematic as well. I know people have done simple alginate face casts without assistance, but I would not recommend it. Safety first. I suggest getting a friend or family member to help out. You can walk them through the process, or even have them watch some lifecasting lessons. It's safer, and you'll end up with a far better mold. I had a feeling you would say that. I will show my brother a video over it, and hope for the best. That is where I got the idea of doing it to myself from. It looked fairly easy, but I was not sure if it was the safest way to go about it when using alginate. This technique does not involve Alginate. It's more of a rough proportion of your head. With Alginate you will be getting every wrinkle and crease i.e. if you were doing hands you'd also get the fingerprint impressions. Again - what are you planning to use the cast for. Jared, I have very successfully lifecast my own face on two occasions, using alginate and of course plaster bandages, however I would only advise it if you are pretty well experienced with lifecasting as it is not easy and you need to be very organised with how you lay things out, because at some point you will not be able to see. Definitely not for the beginner!! i used thermo plastic. reusable, fairly accurate and doesn't require clean up afterwards. Have tried the alginate, taking excessive details on walkthru and knowing where and when what was were. Tried to avoid eyes and nose till last. Maybe odd but i'm familiar with for lack of terms "seeing with my hands" of course again excessive walkthru. my mistake was to much vaseline i used to keep eyebrows etc from catching the alginate. As you may know it promptly crashed... to the floor that is. It's always the details getting glossed over. Since then i have tried the plaster strips once or twice cut into smaller manageable sizes that allow for curvature of the face without buckling or crinkling. With a lot of time and patience i was able to save the eyes for last and after relatively easy removal i filled in the nose and mouth. As said it does only give a rough version but if your not needing details such as creases, pimples etc.. It seems to work tolerably well. Alas, the misanthropy grows stronger every day. Try to make a design that you can assemble. Then go for the parts. The eyes and half of the nose, then the nose (And keeping your mouth open) and so on. Designing the breakthrough will improve your skills. OMG this reminds me of when I did my first lifecast on myself when I was 16. I used plaster of paris, no alginate existed at the time. I had straws up my nose. I talked my mom through the process and had a pen and paper pad to help her. It ended up 5 inches thick. It heated up terribly, and my mom went to bed with it still on my head. The vaseline was not thick enough around my eyelids and eyebrows. So at one in the morning I had about 20lbs of plaster hanging from my face by the eyebrows and eyelids with no help in sight. Eventually it came off but to this day there are eyelashes and eyebrow hair in the final bust. Get somebody to help you and show them step by step the process. get organized and do a dry run. You might be able to get away with a lot of alginate. You could premake a plaster shell in rough proportions. Mix up alginate, pour a lot in the shell, slather it on your face to get the detail quick, then slap the shell on your face and hold. Make sure you can breath!!!! Expect to lose the nose detail, but that can be made later and reintegrated into the final bust. I have not done but My roomate have tried for his friend. She is an ultimate in life casting. Alvin Glad you have worked something out. But remember - often you do not learn something unless you have tried.. True David, when we try then only we can learn. Try is must. Well, I am new in this forum. I will come back soon as I Iike when people replies in discussion.